Reykjavík offers a myriad of adventures and a paradise of possibilities for all who visit! Reykjavík lies just minutes away from magnificent unspoiled landscapes and natural wonders. The perfect way to experience Reykjavík’s healing energy is to visit one of our many thermal pools or spas. Enhance your trip to Iceland by getting to know our culture! Stay up late and be captivated by Iceland's otherworldly illuminations! Reykjavík city is powered by clean energy and characterised by its proximity to nature, where you can try out a multitude of healthy outdoor activities and experience the feel-good energy that comes with all that fresh clean air! Visitors are also thoroughly encouraged to experience Iceland's greatest source of well-being by trying out one of our numerous thermal pools and spas - not only an important part of our culture but also a wonderful tonic for the body and mind. 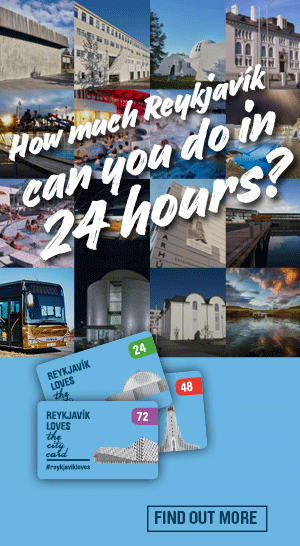 Did you know that with the Reykjavík City Card you are granted free access to all the thermal pools in the capital? Compiled below are services promoting "Health & Wellness"
The new Álftanes Pool offers its customers a bright, warm and relaxed environment, while at the same time those who are searching for fun find their wishes fulfilled. Ásvallalaug is a new and impressive indoor pool complex with a special children’s pool with waterslide and toys, six hot tubs. Through nature and science Blue Lagoon spa treatments and massages provide you with the energy of the geothermal seawater and its active ingredients: minerals, silica and algae. Looking for something fun to do? Why not go skating Egilshöllin newest skating hall in Reykjavík. A local runner guides guests through their home city while sharing facts, history, and anecdotes with the participants. The pool features both outdoor and indoor pools, outdoor children’s pool and paddling pool, two water slides, three hot tubs and a steam bath. The Golf Club is built into an impressive lava field, located on the edge of the Atlantic Ocean. Kópavogur thermal pool is one of the largest aquatic centres in Iceland. It has a 50m outdoor pool, two indoor pools, seven hot tubs, a steam bath and three water slides. A top-class health and spa resort in the Laugardalur Valley with differently themed saunas and steam rooms, a Thalassotherapy Jacuzzi, relaxation room and restaurant. Leirdalur golf course is considered to be one of the most pleasant golf courses to play in Iceland. Dramatically dominating the Reykjavík city skyline is the beautiful Mount Esja - a popular destination for day-trippers and riddled with excellent well-worn hiking trails! Movements Medicine dance practice is one way of connecting the mind with the free flowing breath and the structure of the body. Why not go skating at the Reykjavik Skating Hall! The spa offers some of Reykjavik’s most exclusive beauty and massage treatments, along with completely re-designed facilities that have been created to soothe both body and mind. Sundhöllin is the oldest public pool in Iceland, it was opened in 1937. In 2017 the building was renovated and a new outdoor pool, several new hot tubs and Ice bath were added. Varmárlaug in Mosfellsbær is an outdoor thermal pool, also with two hot tubs, sauna, childrens’ pool and play area. Bakkakot is a 9-hole golf course in a beautiful mountain valley location. It is popular with beginners. Blue Lagoon spa treatments are a unique experience and bring connection to Icelandic primordial nature through the exclusive Blue Lagoon skin care line which is the foundation of the treatments. Elliðaárdalur Valley is a lush recreational area popular with walkers and cyclists alike. Located within the city limits of Reykjavík, the valley features a distinctive fishing river populated with a remarkable number of Arctic char, salmon and brown trout. Playing golf at midnight and surrounded by lava fields might sound too strange to be true. Not in Iceland! Playing golf in Iceland is an adventure you'll remember for a lifetime. With its bushy vegetation, lava fields and caves, this extensive reserve on the outskirts of Reykjavík is a paradise of nature and a wonderful recreational area. This is a small and intimate outdoor pool in a quiet rural area near Mount Esja. It has an outdoor pool and children’s pool, water slide, hot tub, steam bath and gym. The Korpa Golf Course runs along the beautiful coastline of the Atlantic Ocean with stunning views of Reykjavík´s signature mountain. Laugardalslaug is the city’s largest pool with extensive facilities, located in Laugardalur Valley. Its facilities include a 50m outdoor pool, outdoor children’s pool and paddling pool, two waterslides, numerous hot tubs, a steam bath, and mini golf course. Lemon offers sunshine in a glass and gourmet sandwiches. Everything is made from the freshest ingredients available. That is our mantra. Mt. Keilir is a beautiful cone-shaped volcanic mountain and while it is relatively small it is very steep. Once you climb to the top you are rewarded with a beautiful 360-degree view that simply takes your breath away. A little bit of paradise is to be found in the form of a golden-sanded geothermal beach at Nauthólsvík in Reykjavík. At Reykjavík Spa, you can exercise and work out in an exclusive environment with exercise equipment and opening hours to suit busy professionals. The swimming pool in Garðabær is newly renovated, and a popular attraction for both grown-ups and kids. Vesturbaejarlaug is a small and friendly neighbourhood pool, located within walking distance of the city centre. Árbær is an open air museum with more than 20 buildings that form a town square, a village and a farm. Most of the buildings have been relocated from central Reykjavík. Iceland’s number one skiing area, Bláfjöll Ski Resort, is just a half hour drive away Reykjavík. The pool features an outdoor pool, outdoor and indoor children’s pools, outdoor paddling pool, two water slides, three hot tubs, sauna and steam bath. Elliðaárdalur is a very popular destination with the locals for all sorts of outdoor activity, including jogging, biking, walking and playing. The Grafarholt golf course opened in 1963 and is recognized as the Iceland’s premier championship venue and has hosted many European and Nordic tournaments. We offer a wide range of massage and beauty treatments are available, amongst them the all-Icelandic Volcano treatment and Ice & Fire therapy. A 14-hole golf course in a magnificent setting by the shoreline. Lágafellslaug in Mosfellsbær is a thermal pool complex with outdoor and indoor pools, steam room and play area for children with slides of various sizes and shapes. Laugardalur (Hot Spring Valley) is a major centre for sports and recreation in the capital. In Laugardalur you will find a youth hostel, a campsite, and the largest outdoor thermal pool in Reykjavík, Laugardalslaug, in which you can swim all year round. Mosfellsbær boasts a variety of walking, hiking and cycling routes within close proximity of the town. "Úlfarsfell" is lower than its sister "Esja" but offers just as an impressive view over the city. A stunning green area right in the heart of Reykjavík city. Salalaug thermal pool has both outdoor and indoor pools, including a children´s pool, water slide, steam bath, and three hot tubs. Suðurbæjarlaug has an outdoor pool, hot tubs, a waterslide, fountain and indoor pool for the kids. Located next to a fitness centre, this salt-water pool is ideal for kicking back and relaxing. Vakinn is the official quality and eco label for Icelandic tourism.